Come and celebrate summer and the great outdoors. Art4U are hosting Beyond the clouds 2019 Kite Festival from 6 p.m. on Friday June 21st, 2018, an afternoon and evening of kites and fun for all ages. 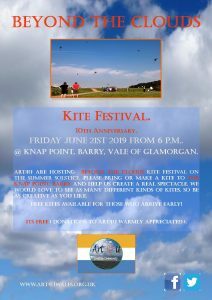 The event, now in its 10th year has grown more exciting each year and is becoming a real spectacle in the Skies above Barry on the longest day of the year.The Vale of Glamorgan Council will running a free Kite and Windsock making workshop from 5 p.m. and the Kite parade begins at 6pm. We love to see as many different kinds of Kites as possible, so there will be a prize for the most exciting and creative Kite on show. Be as creative as you like and the winner will be featured on our website. Kite Surfers are welcome. There will be some free kites available for those who arrive early! Admission FREE (but donations to Art4u are warmly appreciated). Venue: Knap Lake and Gardens, Barry, Vale of Glamorgan. Date: Sunday, 2nd June, 2019. 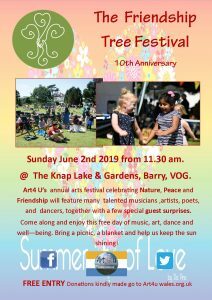 Art4U is set to hold their 10th annual Friendship Tree Festival on Sunday, 2rd June 2019 and this year is set to be the best yet. The event will go ahead whatever the weather! We will feature many local talented musicians, dancers, artists and craftspeople, together with a few guest surprises. Musicians performing include the fabulous; Hank Hillman Band, Wayne Brennan, Danielle Nicholls Band, Naomi Rae Heap, Dlyan Morgan, Persian Bells dance group, Bel Blue and more to be confirmed. The theme of the festival is ‘Nature, Peace and Friendship’. 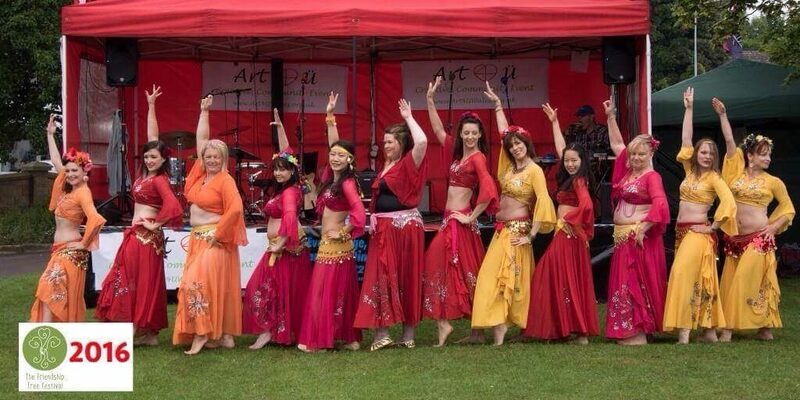 Our aim is to create a gentle event, with a friendly atmosphere. We welcome all members of the public to come and enjoy this free day of music, art, dance, peace and friendship in a beautiful natural setting. Bring a picnic and a blanket and help us keep the sun shining! Free entry, donations warmly received. 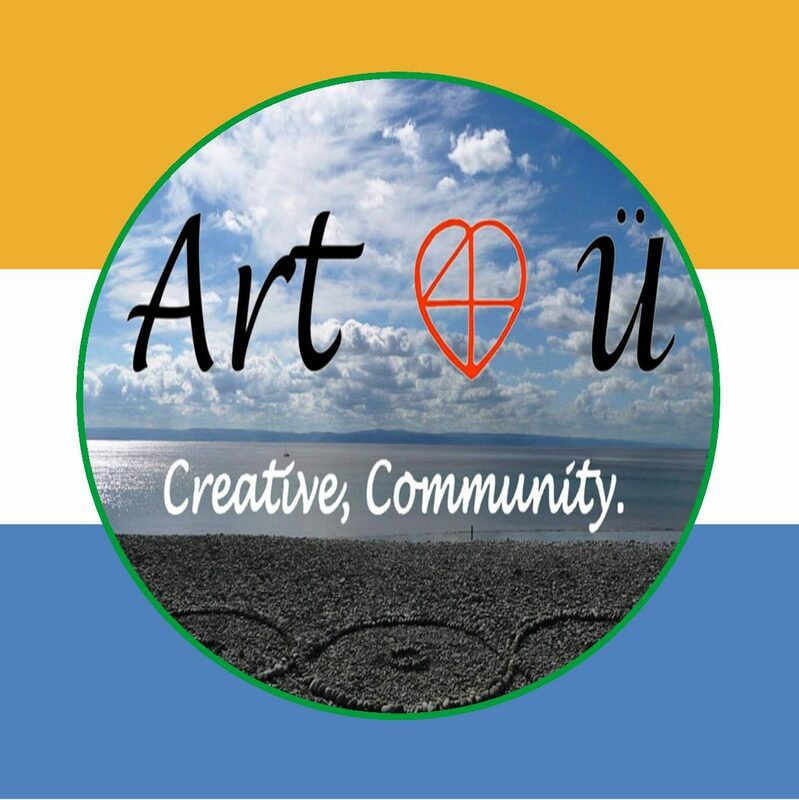 Art4U aim to bring collaborative art to the public of Barry and the Vale and bring people outdoors to celebrate nature. For more information on Art4U and the Friendship Tree Festival, please visit our facebook page @ The Friendship Tree Festival or www.art4uwales.org.uk. Supported by the Vale of Glamorgan Council and Barry Town Council. Please share this information with anyone you think might like to be part of this celebration. Please note: If you are an artist, craft person or well-being practitioner joining us, you are responsible for your stall and anything you bring along.